He was that IT guy friend of Monica's who wanted to be the Ultimate Fighting Champion, wasn't he? Yes, the multi-millionaire with his software company. Jon Favreau will always be Daniel Bateman from The Replacements for me. In the year 2029, an American astronaut (Mark Wahlberg) crash-lands on a strange planet where talking apes rule over the human race. Now he must evade the advancing gorilla army to reach a sacred temple that my hold the shocking secrets of mankind's past - and the last hope for its salvation! It has been exactly five years to the day, since I have last watched this movie. I always enjoyed it since I first saw it in the cinema. Great ape make-up! I also did like the ending, which has garnered a lot of criticism. I always thought that it had just the right amount of an "Huh?" effect, which was needed, because, let's be honest, everybody expected some kind of surprise ending like the original Planet of the Apes had. Much of the criticism stems from the fact, that for most people it did not make any sense. But it makes perfect sense to me. In the beginning of the movie, we have three instances, where someone passes the anamoly from the Earth side (I assume, that the space station is in our solar system), and is transported to the other planet (space-travel) and through time. The later someone passes the anamoly, the farther along the timeline this someone arrives. This is why the crew of the space station arrived thousands of years before the main protagonist on that planet (there was probably some time between Mark Wahlberg's travel through the anamoly and that of the stations). And this is why the monkey arrives relatively soon after Wahlberg (a few days maximum) because there was only about a minute between their travels through the anamoly (the monkey went first, therefore arrived later). Now in the end, Wahlberg traveled back. Thade presumable was freed or escaped some time after that, he went to the lake were Wahlbergs pod crashlanded (which Thade knew about), and traveled with this pod through the anamoly. And as he traveled a lot later through it, he arrived long before Wahlberg on Earth. Now of course, we still have to give a lot of creative license into account, that the changed Earth looks a lot like the Earth we know. But I think it is needed for this cliffhanger to work. All power to you, but I cannot comprehend how anyone can defend that ending. Even Burton can't explain it! I had this for a while and listened to the last chapter with the commentary. Burton gets tongue tied trying to explain it and just trails off. The explanation I heard made more sense: Burton, usually an indie filmmaker, was getting huge hassle from the studio, so he made the ending more like the original book just to make it impossible to do a sequel. A kind of "screw you" to the suits! So now I've found you, all the person that liked the movie I need to ask, did you prefer it to the original? In my opinion, between these two movies it is hard to take a side objectively. Both show the use of make-up effects which were state-of-the-art at the time of release. Besides there being apes which are suppressing humans, these two movies are not that similar. The new one is more action oriented. The new one will never be a classic, it's just a well-made run-of-the-mill blockbuster movie. So, do I prefer it to the original? Not really. Because of the ending and the innovation in make-up effect, the original is a classic. The new one will always be remembered as the movie, even the director does not want to know anything about. But seen as a stand-alone effort of an action movie, I found it rather enjoyable. Actually it's hard to say what I think. I first saw PotA when I was a kid, so I knew the ending before I appreciated the film as a whole. But when I saw it again recently I made an effort to concentrate and to me it seems to be a mix of hokey, 60s surrealism (the boring bit, or as I call it, "Farting About") , followed by a superbly realised and paced section in the ape city. It's simply incredible and I think really captures Heston's plight. It could have been all about the ending, but I found it more powerful than I remember, mainly because it's not that much of a shock if you watch the proceeding story properly (actually, I think if there really is a twist, there's something wrong with the story!). And there he is, trapped. It's the girls face that makes it for me; she has no idea, which just underlines how lost Heston really is. But dated as the original is, the new one feels forced. I suppose I prefer my sci-fi to be contemplative, rather than pure action; or in other words, if the characters and environment are strong enough, you shouldn't need to force it. Incidentally, I went to Lake Powell in 2006, where they filmed some of the sequence where the astronauts first land. It was obvious where I was really! I probably should watch the original again. The problem is, that I have the habit, that when I start to watch a movie boxset, then I have to watch them all. And watching five movies is a little time-consuming. I don't suffer that condition. No-one can make me watch Omen IV, no-one! I haven't even bothered with the other Apes movies. I've seen them over the years, but I think I'd only watch them again for curiosity value. Sounds like I need to take a trip with my Omen set... and put a gun to Jon's head and make him watch Oman IV with me! No-one can make me watch Omen IV, no-one! I haven't even bothered with the other Apes movies. I've seen them over the years, but I think I'd only watch them again for curiosity value. By the way I like the Planet of the Apes movie's (even the remake isn't that bad), just ask my mother about this. My favourite is the third one even if the make-up is cheaper, I like the fact that we see why the apes begin to be more like us. The only one that I don't really like is the second : too much like the first one and nothing really interesting in it (the nuclear mutant is a really weak idea). I also enjoyed the remake for what it is (or is trying to be), and action sci-fi romp. The ending, while in theory rather cool, is too much of a stretch to really work (D.C. looks all the same even with the apes being the superior race...?). I forgot if it made sense to me otherwise (I tend to not pay enough attention to those technical bits; and Tom is a lover of time travel movies, so it's very natural for him to pick up the workings here). 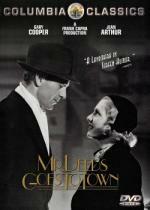 When a small-town idealist (Gary Cooper) goes to New York to collect a $20 million inheritance, he finds romance with wisecracking journalist Jean Arthur, becomes the target of ruthless businessmen and relatives, and finally decides to give his fortune away because it's so much trouble. This milestone film is one of the most charming and best-loved romantic comedies ever made. A classic comedy which did enjoy this time just as much, as when I first saw it. I like the fact, although Longfellow Deeds is potrayed as a little naive (as in not up with the city people), he is acutely aware, when he is made fun of and counters well. The showdown of the movie takes in a court room, where is antagonists try to get him declared insane. Although this court room scene takes about 40 minutes, and never gets boring. Not as good as I remember it being. I remembered it as being a worthy remake of the original "Mr. Deeds Goes to Town" movie, where my only real complaint was the stuff with that black foot. Now watching it directly after watching the original movie, it lost quite a bit. But I still enjoyed it. It is a decent Adam Sandler style comedy remake (in parts more like a parody) of the original. A fun German romantic comedy, which can easily hold up against Hollywood RomComs. At first I was a little sceptical about this movie, as it stars and is written and directed by Til Schweiger. But after having heard a lot of good stuff about it, I have bought in a recent Blu-ray sell. The German Blu-ray disc provides English subtitles, if someone should be interested in this movie.